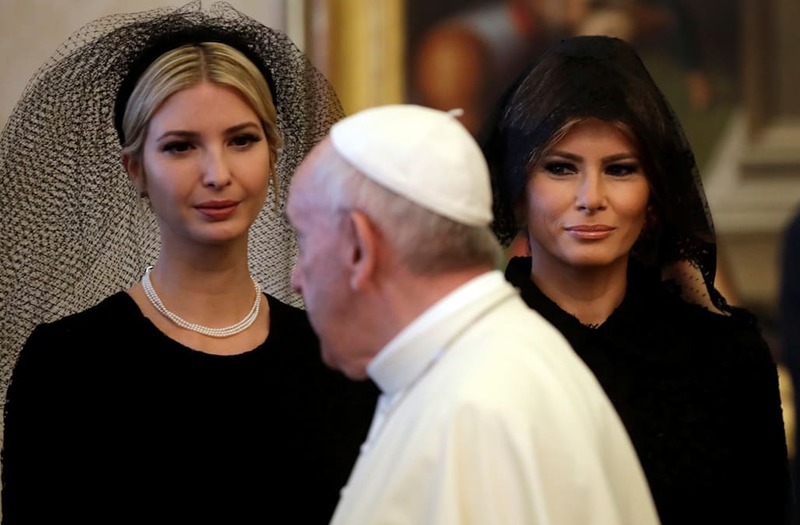 During a meeting with Pope Francis on Wednesday, U.S. first lady Melania Trump and President Donald Trump's daughter Ivanka Trump dressed in all black with veils covering their heads. The lace veil — technically called a mantilla — has been worn in the presence of a Pope by many former first ladies, including Jackie Kennedy, Pat Nixon, Betty Ford, Rosalynn Carter, Nancy Reagan, Barbara Bush, Hillary Clinton, Laura Bush, and Michelle Obama, according to historian Carl Anthony of the National First Ladies' Library. But when it comes to Saudi Arabia, the same first ladies didn't wear a headscarf or covering. "In contrast, none of those incumbent first ladies who visited Saudi Arabia wore head coverings, since they were not meeting the single, recognized leader of the global Islamic faith, but rather political leaders where a cultural custom of head coverings by women is not 'required' by those visiting from other nations," Anthony told NBC News in an email. But Anthony said many of those same first ladies who didn't wear a headscarf in Saudi Arabia, did at some point wear a headscarf when entering mosques or churches that were active places of worship. When it comes to the Vatican's rules, women aren't technically forced to wear the mantilla, either. German Chancellor Angela Merkel and British Duchess Camilla both did not wear the mantilla when they met with the pope. Stephanie Grisham, a spokeswoman for the first lady, told the Associated Press that Melania Trump's decision to wear a mantilla followed Vatican protocol that women who have an audience with the pope wear long sleeves, formal black clothing and a veil to cover their head.